home surgery: June's Recommended read + a goal! I like to cook, I actually love to cook if there is someone to cook for. I especially enjoy cooking for company. I pour a glass of wine, listen to music and work away. Sadly, I've been so busy focusing on my life, kids and business that I haven't set aside much time for cooking lately! I was always busy but some how found time to cook at least four days of the week when my husband lived with me. There is something about sharing a meal with someone that's more enjoyable then dining alone. As you know, it's just my kids and I now, so cooking hasn't been my top priority. Although, eating healthy should be. I constantly try to introduce new and fresh foods to my children but children will be children and on some days I'm lucky to get my three year old to eat anything never mind something "foreign". That brings me to this month's recommended read. 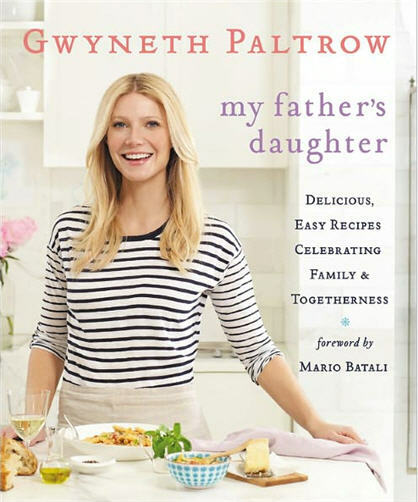 Gwyneth Paltrow's new cookbook "My Father's Daughter". It's currently in my Amazon cart and I will be eagerly awaiting the books arrival. I agree with Gwyneth's approach to cooking on a number of levels. I too try not to eat processed foods, I also eat fresh, and organic when possible. I love that she includes her children in the cooking process, I try my best to do the same! Okay, now onto my goal. No, I'm not trying to copy "Julie" from the well known book and film "Julie and Julia", but I do need some motivation to start cooking again. It's healthier, cheaper and also some what therapeutic.